Some people are having a climate meeting(气候峰会) in Paris this year. Leaders from all around the world hope that the meeting on climate will have good news for people. A lot of people outside the meeting want to go to street and say something for the climate change. But the France government didn’t want them to do that because of the Paris attacks(巴黎恐袭). So they think of another way to show that they want to go to the street. They let people leave their shoes in a big square. 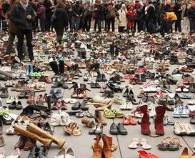 Each pair of shoes means a person. Many famous people, like the Pope（教皇）, put their shoes in the square. 1. Leaders come to_______ for a meeting. 2. The meeting is about______. 3. The France government thinks it is________for people to go to the street. 4. A pair of shoes means a______. A The Pope cares about the climate, too. B Leaders don’t care for the climate change. C The shoes on the square are for poor people. D France government thinks the meeting is dangerous.